Here’s why FEMA’s flood maps are so terrible. Why Are FEMA’s Flood Maps So Horribly Flawed? They fail to take climate change into account, and they’re hard and expensive to maintain. Plus, they can be manipulated by local governments. Flooded homes near Lake Houston following Hurricane Harvey on Aug. 30 in Houston. Last week, Hurricane Harvey devastated the city of Houston. The scale of the tragedy shocked even the National Weather Service. But perhaps the most shocked set of people is the 40 to 50 percent of Houstonians who live outside Federal Emergency Management Agency’s mapped high-risk flood zones and yet still found their living rooms underwater. But as we have seen, both last week and in years previous, FEMA’s predictions are also frequently wrong. Why? Some of the reasons are the ones you might have guessed. FEMA’s maps are backward-looking, often out of date, and based on historical flooding and development. They don’t anticipate trends pointing to the future of climate change and rising sea levels, shown by repeatedly flooded areas in Houston that lie outside of supposedly 100-year and 500-year flood zones. And, of course, 100-year and 500-year floods are occurring much more frequently than we’d expect, implying that those zones need to be updated. The maps also don’t account for rapidly expanding development in flood-prone suburban and exurban regions. But another issue is the amount of control local politicians exert on these maps. As flood maps are developed, some local officials and communities have disproportionate influence on how they take shape. Politicians prefer to keep flood zones small to save their constituents money and allow for more development, according to new research by Sarah Pralle, a political scientist at Syracuse University, presented in San Francisco at the American Political Science Association’s annual conference on Thursday. Pralle interviewed federal, state, and local managers and contractors as part of her research. “The overriding concern of local officials is to reduce the size of flood maps and to reduce base flood levels,” she says. That’s because the 100-year flood crest level, whatever it may be, then dictates the level at which buildings must be built. 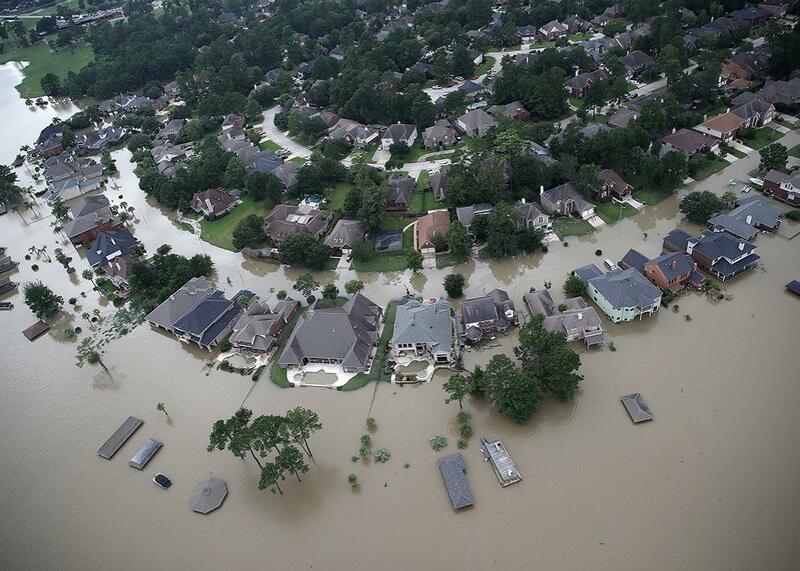 Local residents have a vested interest in making flood zones as small and low as possible, so they hire surveyors, engineering firms, or lawyers to help challenge and appeal FEMA’s preliminary maps. Of course, FEMA tries to accurately communicate flood risks, and its maps, which are tied to the National Flood Insurance Program’s rates, have saved the country money. But since climate scientists predict sea levels will likely rise 1–3.2 feet this century—with the higher part of that range coming from emitting greenhouse gases in a “business-as-usual” scenario—the maps need to address that. But even in a scenario in which the government agency wants to take climate change as seriously as it should, the maps are hard to adjust. Like the census, it takes time and billions of dollars with each update. And a FEMA official who responded to my request for comment said that after Harvey, its focus is on recovery, rather than mapping. Unfortunately, we have neither the ability nor the political will to update the maps in a reasonable fashion. Far from providing the additional funds the organization would need to rethink its zoning recommendations, President Trump proposed cutting the organization’s budget by $190 million in his (largely meaningless, except in messaging) budget. His budget would also drop local communities’, states’, and tribes’ grant funding for disaster mitigation, which would be used to help prepare for the next hurricane. And while Congress rejected Trump’s dramatic budget, it hasn’t contributed extra funding either. In 2012, Congress recognized the need to evaluate our existing mapping program and the potential to include considerations for climate sciences and future conditions by establishing the Technical Mapping Advisory Council (TMAC). The TMAC is a federal advisory committee established to review and make recommendations to FEMA specifically on these issues. We have worked to support the TMAC in their review of our mapping program and will continue to work with them as they outline reports and recommendations to improve our programs in this space. But the agency has yet to act on those recommendations. Currently, New York City is the only place in the country that takes climate change into account when mapping flood zones, following a special program adopted after Sandy. If FEMA doesn’t find the funds and political will to reform its flood mapping system, it won’t stop the flooding. We’ll just continue to be underprepared, inundated, and overwhelmed.